‘Tis a strange and wonderful problem to have, but each yeear during our annual custom bike show, we’re so busy with the organizing end of things that there’s amazing custom bikes that miss our eye. 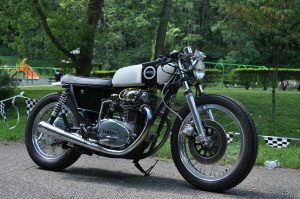 Oftentimes- and this past August’s even was no exception- we’ll be strolling through the crowded park, running one errand (or twenty) when we come across an attendee’s motorcycle that’s clearly as fine and well-built as any entered in the official show. It’s a mystery why so many crowd-gathering machines don’t end up in contention for prizes; some owners confess that they simply can’t stick around long enough for the ate afternoon trophy ceremony while others just aren’t that interested in seeking approval for their work. Our popular People’s Choice Award which allows the crowd to select one of the show’s top winners (who rode away with over $2,000 in swag, by the way) often finds folks asking us why their favorite custom bikes aren’t wearing entry numbers, a question we just don’t have an answer for.